Celebrity photographer finally gets a show at his gallery's Los Angeles location. The saying was on our mind Thursday night as we chatted with celebrity photographer Timothy White, whose memorable photo above of Williams, a PR/marketing shot for The Birdcage snapped in New York but never released, and portraits of other famous folks are on display at the Morrison Hotel Gallery in Los Angeles, located in the lobby of the Sunset Marquis hotel. It’s the first time White, co-owner of a gallery that began in SoHo and now also has a location in Maui, has enjoyed a dedicated show at the L.A. location. The black and white pieces in the showing of 41 framed White photos are especially striking, from a young Sylvester Stallone looking like Robert Mitchum, to a much older Walter Matthau gazing intently at the lens alongside Neil Simon and Jack Lemmon, to a distantly shot Sharon Stone, ready for her non-close-up on the staircase of an old Spanish-style mansion. Additional photos taken by White are on permanent display in various areas of the Sunset Marquis, as he also acts as the hotel’s cultural curator. We nibbled on the complimentary food at one point in front of an over-sized black and white close-up of Harrison Ford, who White has shot a staggering 85 different times now. There are four recording studios in the basement of the Sunset Marquis. Somewhat astonishingly, last night’s revelers, drinks in hand, were allowed to roam freely through these facilities and soak up a little bit more celebrity intimacy. 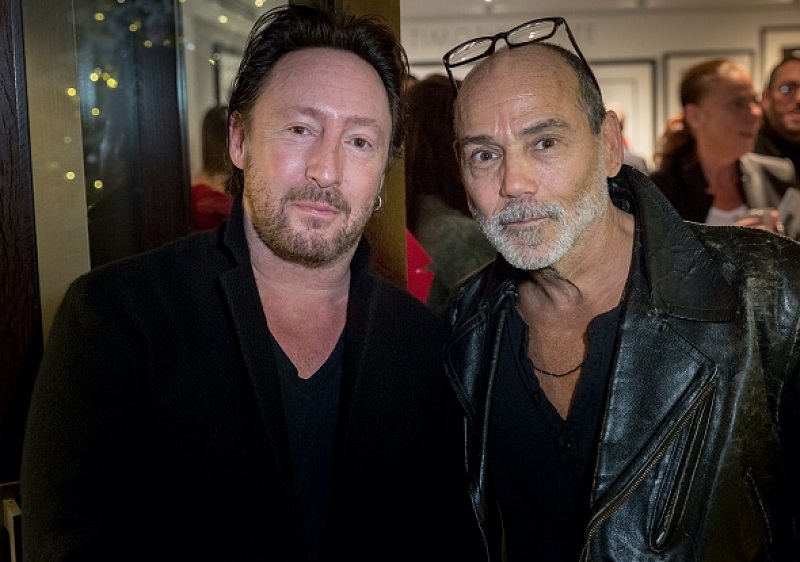 During our time in that corner of the fabled West Hollywood hotel, we were told that Julian Lennon, whose work was featured at the flagship Morrison Hotel Gallery in 2010, had been at the recording studios at the outset of the Christmas party. That’s Lennon above, dropping by the gallery to say hi to his pal White. The Timothy White exhibition runs through Dec. 26. Hours of operation for the Morrison Hotel Gallery Los Angeles: 10:00am–8:00pm Monday through Wednesday, 10:00am-11:00pm Thursday through Saturday and 11:00am-7:00pm Sunday.